All of our products are made to keep buyer, baby and the planet happy. We use 100% GOTS certified organic cotton and all our baby and toddler clothing is ethically and sustainably sourced. 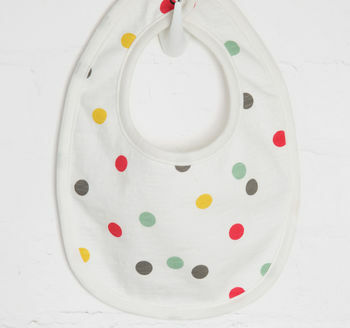 This baby bib is an ideal gift for any babyshower, new baby or birthday gift. Our organic cotton bib comes on a soft off-white cotton base with gorgeous drops of colour that brighten up any Winter day. This trendy bib is backed towelling for extra absorbency to keep little ones dribble-free and cosy during Winter months.